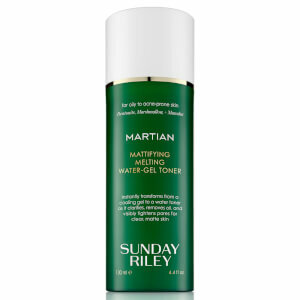 Experience a purifying cleanse with the Sunday Riley Ceramic Slip Cleanser, a plant-based cleanser formulated with four plant-based soaps to leave skin feeling clean, hydrated and revitalized. Eliminating dirt and impurities without stripping skin, the gentle face wash utilizes French Green Clay to draw out dirt, oil, pollution and makeup. It performs a deep cleanse on pores to decongest and refine their appearance. Suitable for all skin types, including sensitive, the foaming cleanser will gently yet effectively clean the skin while replenishing hydration. Its dose of Rice Oil Esters protect against dehydration. Skin is left feeling softer, balanced, healthier and radiant. Massage into the skin to remove dirt, oil, pollution, and makeup. Rinse with warm water. Water/Aqua/Eau, Disodium Laureth Sulfosuccinate, Octyldodecanol, Polyacrylate-33, Propanediol, Polyglyceryl-2 Caprate, Sodium Cocoyl Isethionate, Montmorillonite, Kaolin, Olive Oil Polyglyceryl-6 esters, Rice Oil Glycereth-8 esters, Phospholipids, Sodium Methyl Cocoyl Taurate, Sodium Lauroamphoacetate, Bisabolol, Pentylene Glycol, Sodium Chloride, Sodium Phytate, Caprylyl Glycol, Dehydroacetic Acid, Benzoic Acid, Propylene Carbonate, Linalool, Farnesol.